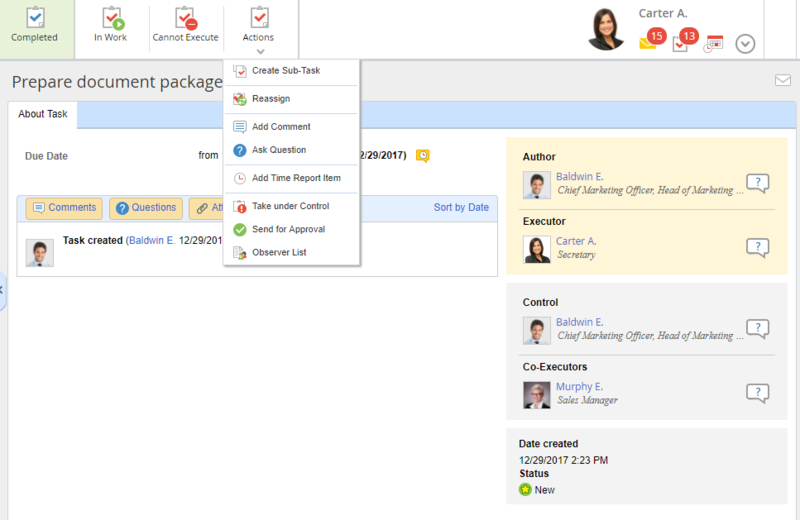 in the Tasks section, click Task or Task – Create Task. On the opened page, fill out the fields and click Save in the toolbar. The required fields are marked with an asterisk. One task can be assigned to several executors. To do so, select several users in the Executor field. In this case, each of the users will receive the task. You can specify the task start date and due date. If the task is not completed in time, it will be highlighted red in the task list. 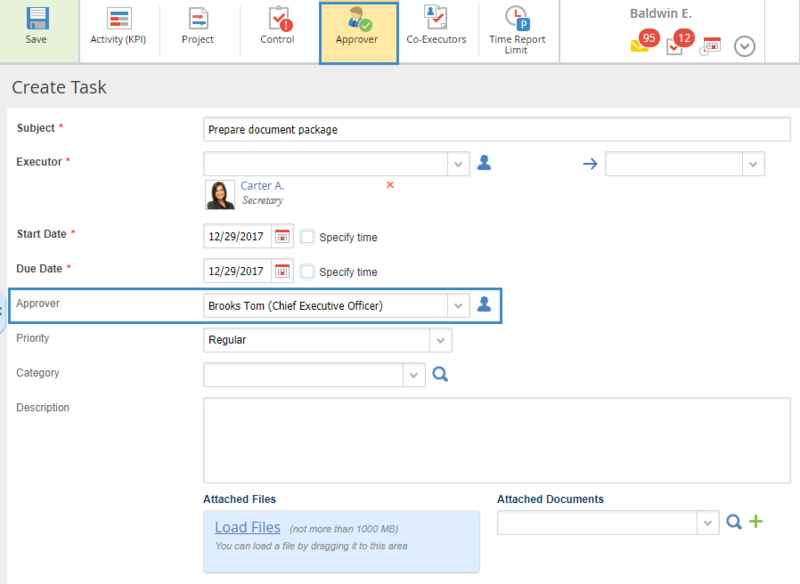 You can attach files or ELMA document to a task. 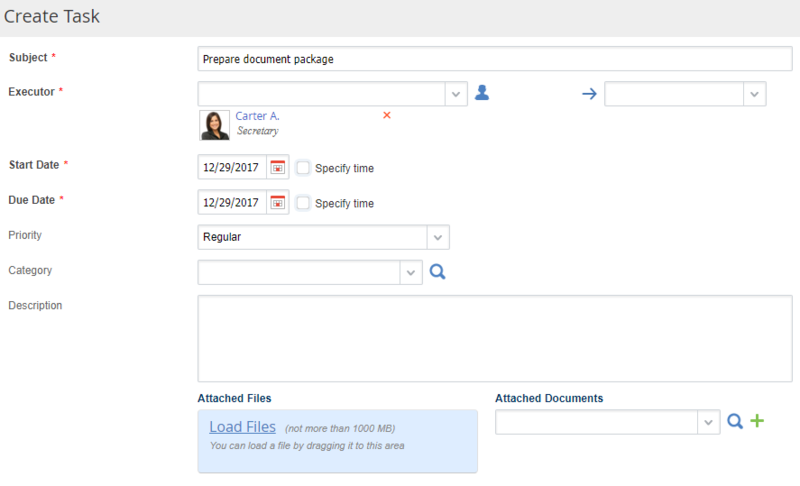 For this, click Upload files or select documents in the Attached Documents field. If you click on the green plus icon, you can create a new document that will be attached to the task. 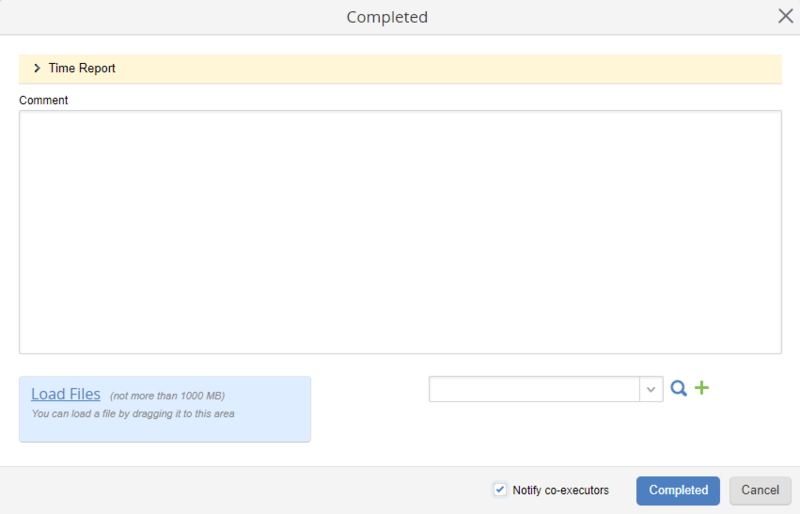 Completion control can be added to any task. By default, a task is controlled by its author, but you can select another user for this role. Click Control in the toolbar and fill in the new fields. There are three types of task control: Completion check, Task monitoring, Notify when completed. To learn more, read ELMA Help. When creating a task, you can select its approver, who makes the final decision to assign this task. To select a task approver, click Approver in the toolbar. In the appeared field (fig. 3) select a user. You can select only one approver. After creating the task, the selected user will receive it for approval (fig. 4). The approver makes a decision by clicking Approve or Reject. The task will not be assigned until it is approved. Apart from the executor, you can select co-executors - users who will also participate in the task execution. Co-executors are not responsible for the execution of the task, only the executor is responsible. 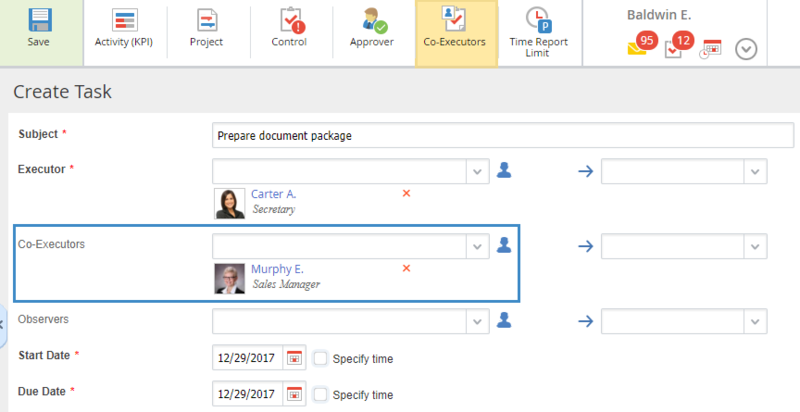 To select task co-executors, click Co-executors in the toolbar when creating or editing a task. An additional field will appear on the form, where you can select co-executors. 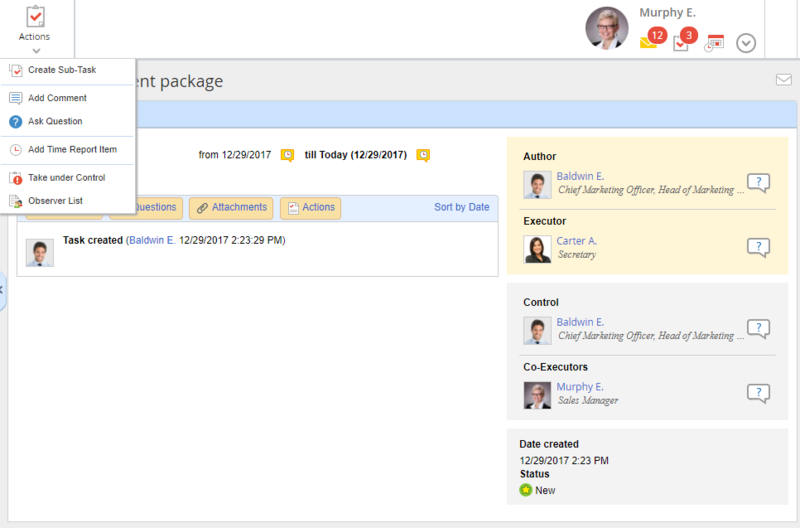 Task co-executors will receive a notification about the task. The task page is displayed differently for executors and co-executors. The Completed and Cannot Execute buttons are available only for the executor. Only the Actions button with limited options is available on the task page for the co-executor. A co-executor can submit a time report on the task, create a sub-task, add a comment to the task or ask a question on the task. 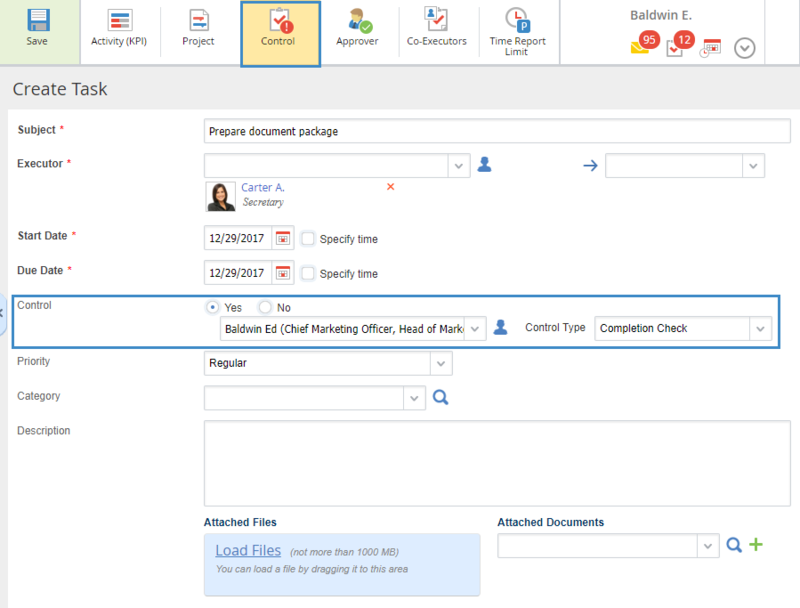 To complete a task, its executor needs to click Completed in the toolbar on the task page. Notify co-executors - if this box is checked, the task co-executors will receive a notification that the task is completed. After filling in the fields, click Completed. The system will log the task as completed. If task control is enabled, the controller will receive the task and decide whether to reopen the task or confirm that the task is completed.